Our June Studio Showcase winner, Antoinette, is all too familiar with the frequent moving in military life. As the wife of a Marine, Antoinette and her husband moved five times in the last five years. "It's something I actually really enjoy but my craft supplies don't" she says. Antoinette discovered scrapbooking 20 years ago, but it wasn't until her husband introduced her to the spouse of another Marine that she discovered card making. "Something magical happened" she says. The two crafty hobbies, scrapbooking and card making, awakened the passionate, creative and fun side Antoinette says her right brain craved. When we asked Antoinette what inspires her, she answered... "Jesus Christ inspires me and I feel like He has recently merged two passions of mine together, card making and serving. Service members who serve to protect our freedom and our country have always been near and dear to my heart." 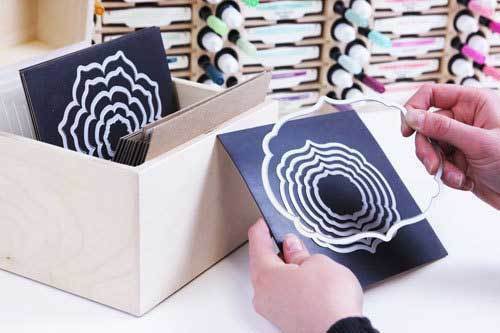 In July Antoinette is hosting a card making class called Operation Card Package. She'll have card making stations set up at her house and will be making as many cards as possible to send to service members overseas so they can then send the cards back home to family members and loved ones. How cool is that! Antoinette is also creating cards for a Military Families Appreciation event in August called Cards for a Cause. Recently Antoinette's husband received orders to PCS (permanent change of station) early. This meant they would be at one duty station for a full three years. Antoinette finally had the opportunity to really set up her craft space! 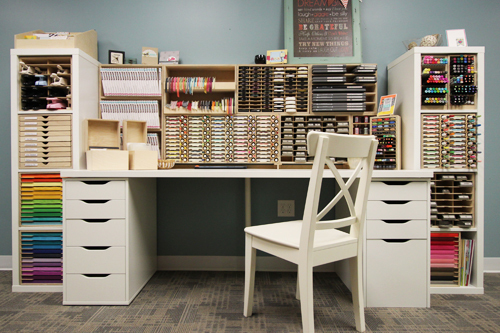 They chose an 11'x13' space on the second floor that works as a dual purpose room, an office and paper crafting area. For years Antoinette used folding tables and Iris cases for storing her 12x12 papers. "This was easy to breakdown when moving but in the long run it wasn't great" she says. In her new space she has rearranged, and rearranged it again, to make sure it is set up in a way that is ideal for her needs. 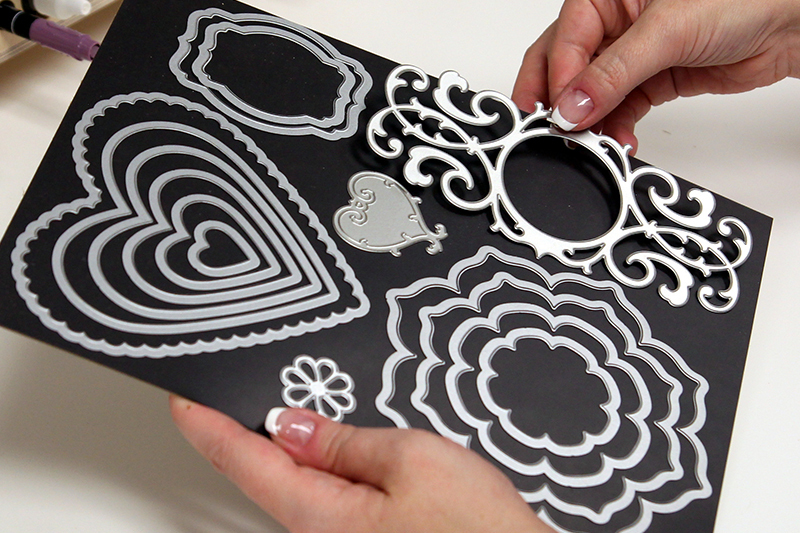 When designing her space, Antoinette wanted to make sure she had a crafting space for card making and another for scrapbooking. She didn't want to clean up one project in progress to begin another so she purchased a Teagan desk at World Market and a bookshelf with desk from Macy's. "We assembled and then disassembled the table. I had half my craft stuff on the floor for a while and that was not very inspiring. However, my husband was an inspiration to me at the time. I loved how he would go into the office/craft area and help me through the confusing process of figuring out how to make the space just perfect for me. He had so much patience when I didn’t know exactly what I wanted, and it was incredible for me to see how much he enjoyed helping me get to the final setup." "I am a fanatic when it comes to having everything in its place yet easily accessible as well" Antoinette says. 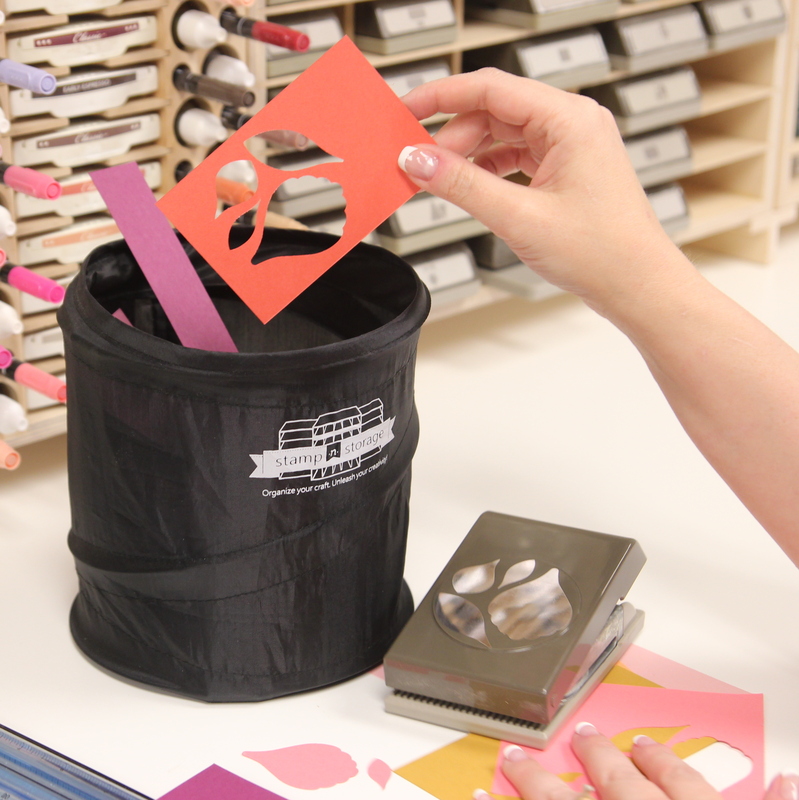 This is why she and Stamp-n-Storage were a perfect match. Antoinette purchased a nine cube storage solution from Lowe's, she loved the warm chocolate color, and then began planning organizing with Stamp-n-Storage products. "My first order of business was that paper! I could not stand the idea of flipping through those Iris cases anymore. I knew I needed a better more efficient system. 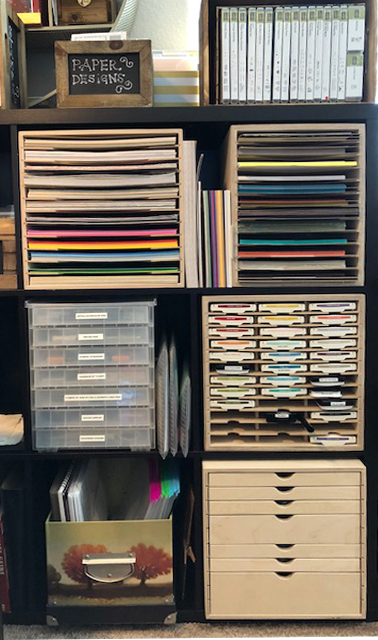 The 12x12 Paper Holder for IKEA was the first purchase I made from Stamp-n-Storage, and I was so impressed with the craftsmanship and the quality. 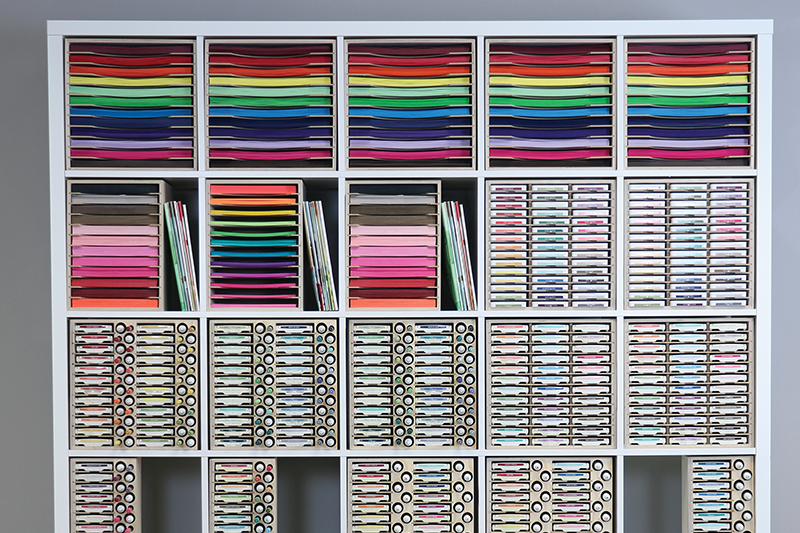 It has been an amazing way to organize all my large paper." 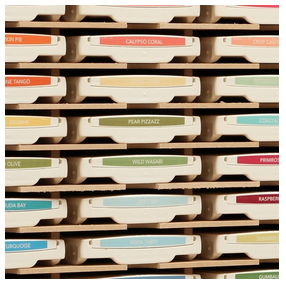 Antoinette then purchased the 36 Ink Pad Holder to store her Stampin' Up!® ink pads. 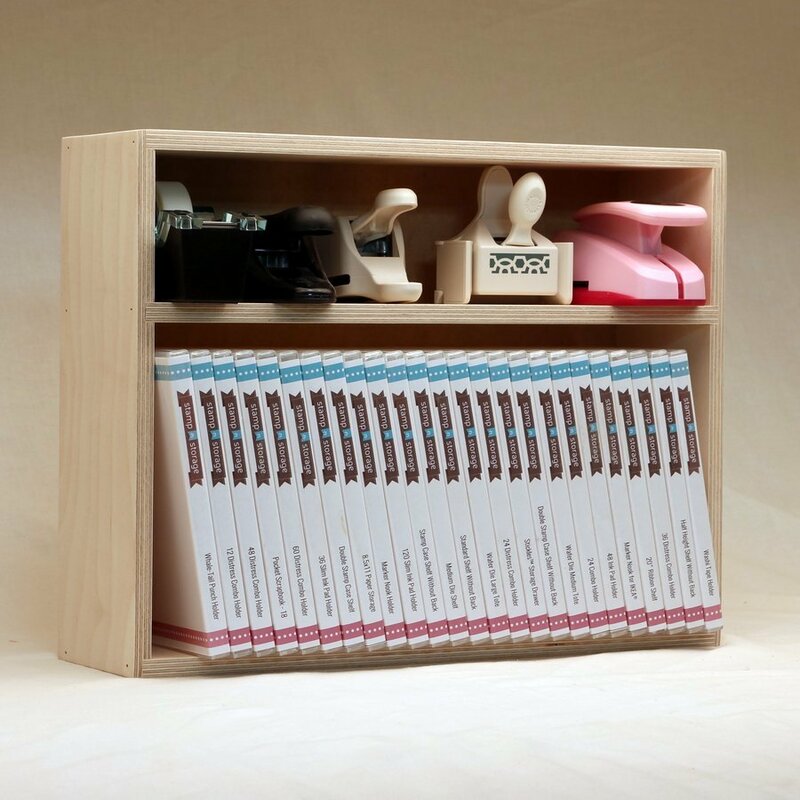 "Previously, I had all my Stampin’ Up® ink pads stacked on top of each other, but as my collection grew this stacking method started to frustrate me" she says. Antoinette also uses her storage solutions for quantity control. "I think the hardest part was figuring out what size to get. I’m always afraid of buying the wrong size and being stuck with either something too big or worse something that doesn’t fit all my supplies. In the end, I basically limited myself to a certain number of ink pads that I could expand my collection to; once the Ink Pad Holder fills up then I cannot buy anymore ink pads. That’s how I control my collection. Keeping it small-to-moderate limits my spending because I actually have no additional storage to put more product." 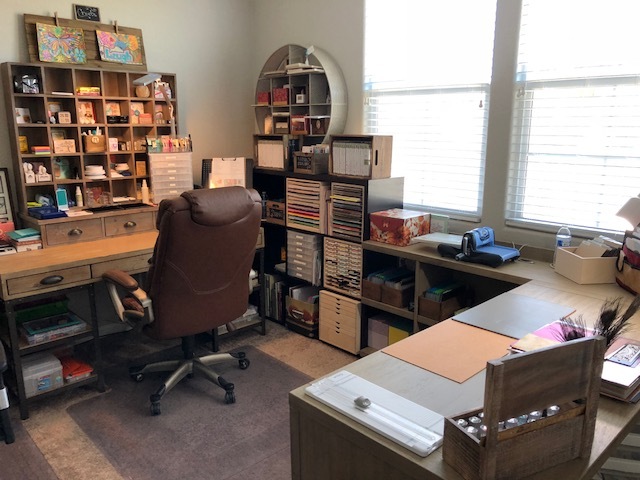 "I also purchased the 8x11 Standard Paper Holder because I realized my Stampin’ Up!® paper was literally in a pile and it wasn’t working for me anymore. Along with that, I decided to try out the Paper Holder Label System. 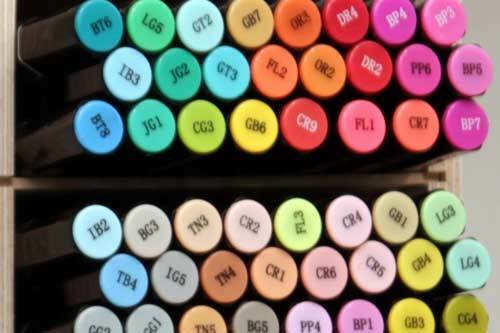 It definitely has been helpful in identifying the various paper colors I have. I also like the Paper Holders because they have allowed me to keep modest in my collection. Once my Paper Holder slots are full, I do not purchase any more paper until a space becomes available again. 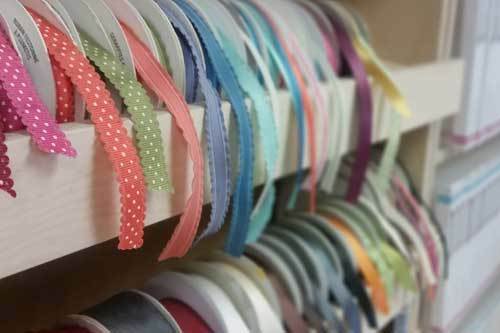 I don’t want to purchase too much paper where I become overwhelmed with my selection." Also in the above photo you'll see the Drawer Cabinet for IKEA that Antoinette purchased when she visited the Stamp-n-Storage Pop-Up Sale in California earlier this year. "I met the staff and Brett. I was so impressed with their down-to-Earth friendly personalities and especially with their excellent customer service. This reinforced my positive thoughts about the company and made me a customer for life. I purchased 6x7 Magnet Cards and got my first Drawer Cabinet with a double and triple drawer. I highly recommend the Drawer Cabinet Accessory Trays especially the 30 Compartment Embellishment Tray and the 15 Compartment Deep Tray. Take a look at my close up pictures to see how I am utilizing this amazing Drawer Cabinet to organize several of my crafting supplies! The drawers fit my Ranger Distress Oxide Inks and Distress Mini Inks perfectly! The Triple Drawer fits my alcohol ink supplies really well, too. In the single drawers I keep specialty papers such as vellum and watercolor paper. I feel like there is an infinite number of possibilities for what I can store in these drawers! " 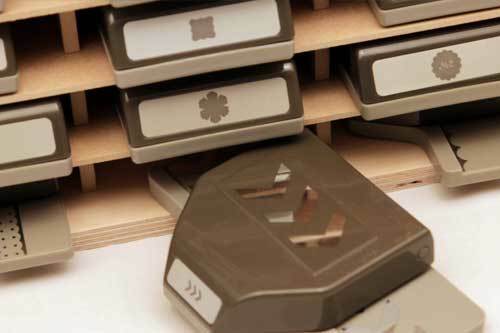 Antoinette recently switched from organizing her dies in a binder to the Wafer Die Storage without a cover. "I decided to switch to that, and it was definitely a wise decision! I had a hard time figuring out if I should get it with or without the cover since we move so much. I think buying it with the cover would have been better for moving, but I also didn't want to lift that or leave it open each time I used it. So, I think buying it without the cover has been great because I keep it right by my BigKick so I can easily flip through my magnet cards to see what die I want to use. I really like the magnet cards. I decided to go with the 6x7 Magnet Cards, and they have been the absolute perfect size for my die sets!" Another special piece in Antoinette's space was found by her husband when the two were out shopping. She had run into Michaels and he decided to walk around HomeGoods. " When I came out of Michaels, I asked him if he found anything interesting and he found that amazing piece you see on the World Market desk. I feel like it is truly one of a kind. I had been searching for some way to keep all the small craft supplies I use in front of me so I could easily reach for them when I craft. This was perfect for me! My mom calls it an old post office letter box; it does remind me of that. It’s been wonderful to have so many items right in front of me but not taking up space where I’m crafting. I absolutely love it! 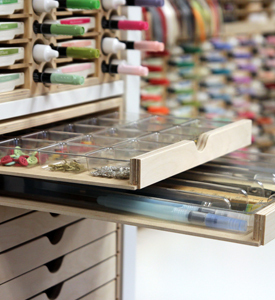 The three drawers are perfect for my envelope maker, my dauber storage case, and additional projects I am working on but want cleared off my desk space for the time being." When we asked Antoinette if she had one tip to share with other crafters what would it be, she said: "...it would be to think about what items you use the most and where you would ideally like to keep those items (i.e., horizontal storage on your desktop, vertical storage on your desktop, underneath on shelves, or in a Kallax or storage cube system). I used a storage system that is similar to the IKEA® Kallax but I purchased mine at Lowe’s. Once you figure out what items you use the most and where you would like to keep those items you can really start to look at the types of storage available for those supplies, products or tools. I tried to tackle everything at once and that was overwhelming and kind of frustrating. Break it down into what bothers you the most. For me, it was paper so I started organizing my 12x12 paper first and then my 8x11 paper. After that I moved into my 6x6 and other paper sizes. I divided organization into themes so that I would focus on one area at a time. The very last thing I just conquered was how to organize my scraps. FINALLY!!!! I have come up with a storage solution that is amazing and works so well for me. You might be able to catch a glimpse of it on the BookCase shelf where I have 3 wooden boxes. " 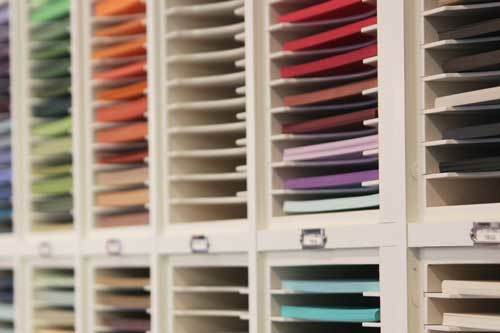 "It’s been wonderful to have a space finally set up especially with the organization that Stamp-n-Storage products provide. In one year, we’ll be moving again. I think this move will be a lot smoother for me since everything is organized so well now. " Thank you Antoinette for sharing your craft space with us, your heart for the men and women in service to our country and the sacrifices you and your husband have made to protect our freedom. God bless you both!